Most people know what camber is, but not many know what caster and toe are. 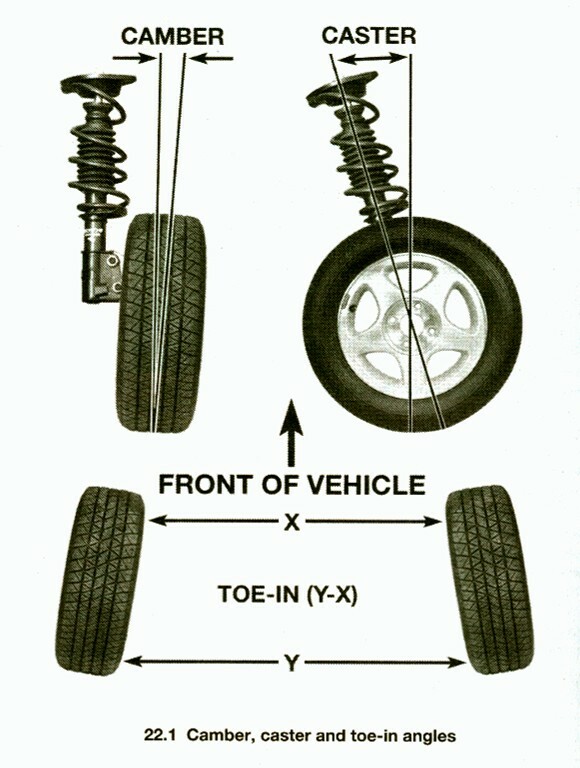 Here is a diagram from the Haynes manual that explains it perfectly. There are several options in the way of springs. The manufacturers of struts for the 3rd generation Maxima are as follows: KYB, Tokico, and Koni. KYB struts are the closest to stock feel. They are responsive, yet supple. Tokico struts are firmer than KYB and give better road feel. Koni struts give the option of adjustability, so they can be as soft or firm as you want. As most of 92-94 Maxima SE owners know, the VTC (Variable Timing Cam) sprockets make a clattering noise if broken when the engine is cold. Having them replaced is a $2500 job. The VTCs themselves cost $530 each, and there are two. I also had to have two $80 tensioners replaced as well. The issue is a life-or-death situation for your engine. Once the VTC Sprokets fail completely and break, the timing chain will be messed up and you will be paying $4500 for a new engine. Let me just say that there is no other RECOMENDED remedy for this problem. I have spoken to Nissan experts (those affiliated with a dealership and those not affiliated with a dealership) and they strongly disagree with grounding the selenoid at the risk of further engine damage. By grounding the VTC, there is also a loss in power. I have noticed an increase of low-end power after the repair. The car runs so much smoother than it ever did. In my case, with only 85k on the engine, I felt that it was well worth the money to have it fixed. VTC Update: At 160k on the engine, there have been no noises in the VTCs since the repair. By the way, my driving style is not exactly granny like. The VTCs have held up in 140 mph runs, 80-90 mph daily driving in rush hour with hard accelerations. When running properly (with the VTCs fixed) this engine is practically indistructable.